On the day of the show everything went smooth. 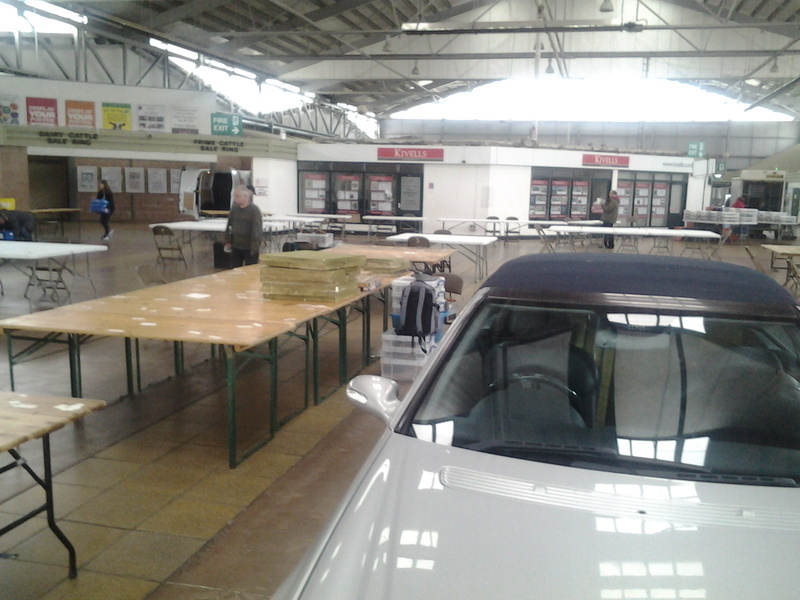 The journey to the show took only 6 minutes, I was first there so drove into the show and unloaded my car next to my allocated tables. Within 90 mins I had the game set up, just as the rest of the boys from Plymouth turned up so we went for a fry up. The catering on site is the best of any show I have ever attended. 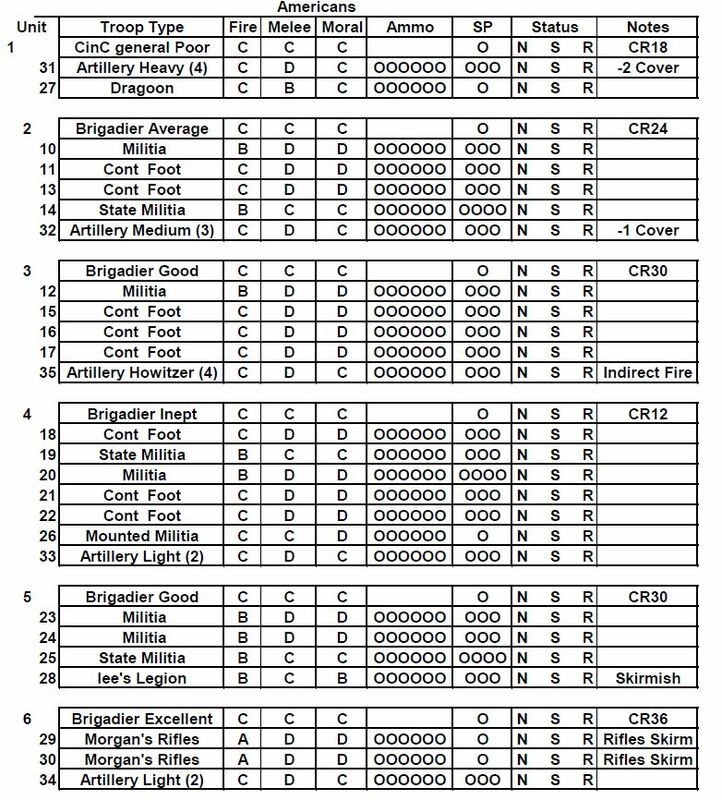 Here are the orders of battle. Normally we allocate a card to each commander and randomly draw then to see who is activated. We also include an end of turn card which allows all unactivated commanders to initiate a command test or fire, it also requires the shuffling of the reformed pack. 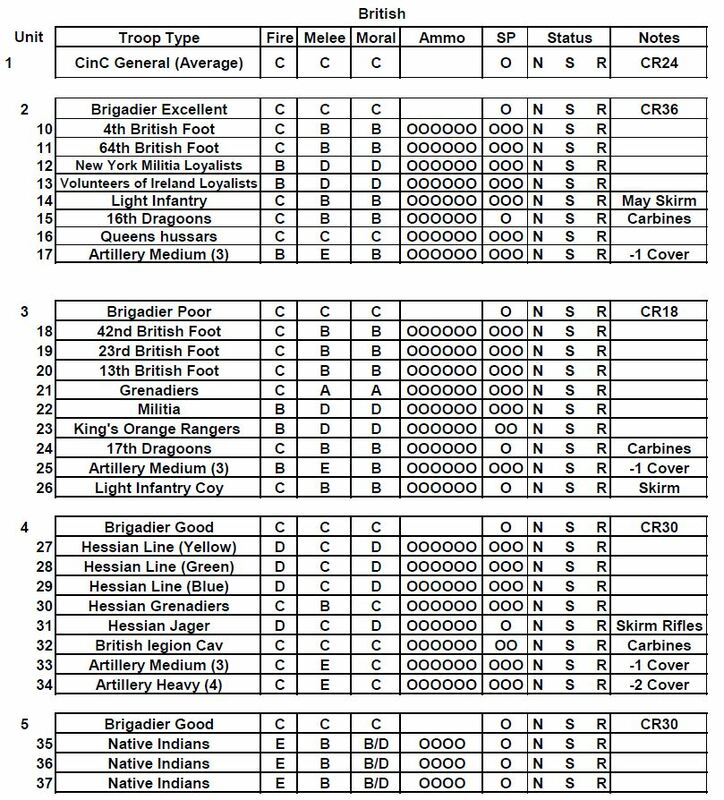 Having just bought the Battle honours rules for WW2 we decided we would allocate a colour of card and allow the activated player to chose which commander to activate. The Joker was the end of turn. 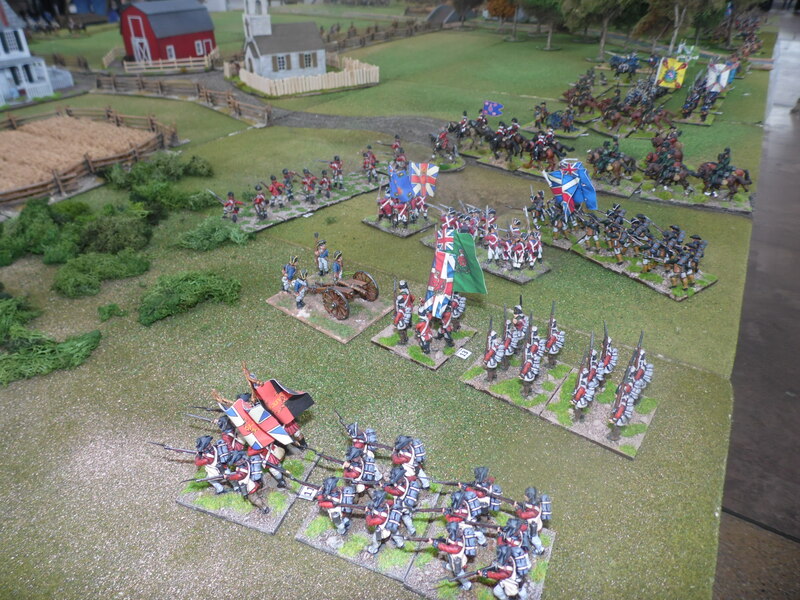 The British suffered in the first couple of turns as most of the Americans were activated but only one or two British were before the end of turn. 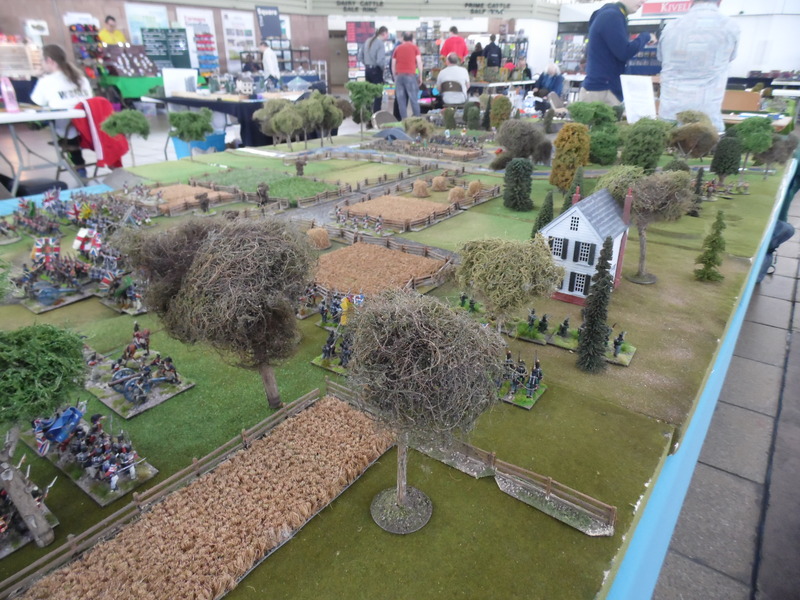 The Hessians took and early casualties from the heavy gun of the Americans and this in turn seemed to fixate the British on counter battery fire when activated. 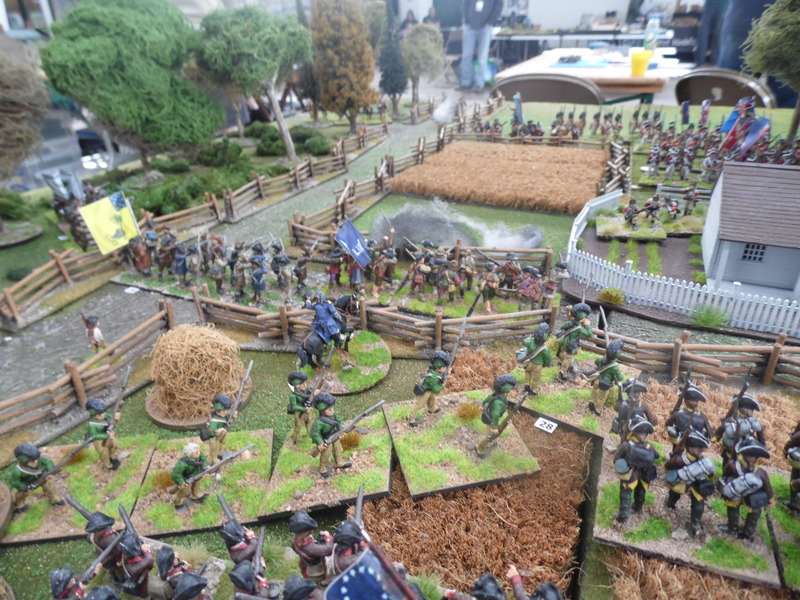 Hessians advance to the fence line all the time being pick off by Morgan’s rifles and a dogged 2lber gun. 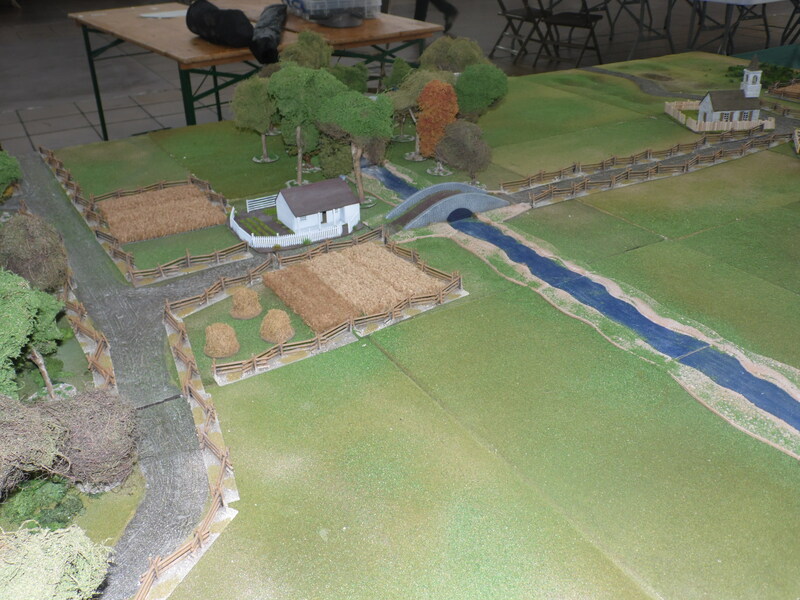 The British /Hessian centre tried to advance and capture the centre of the field. 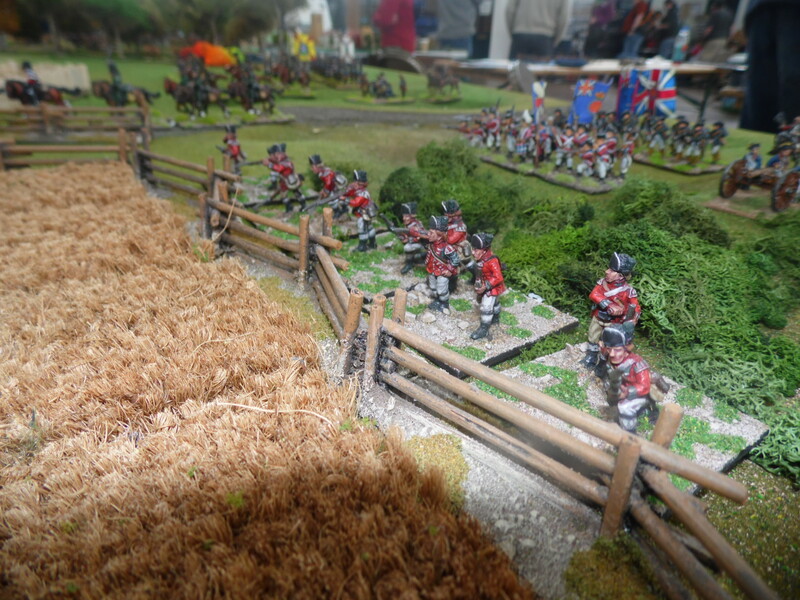 Holding the fence line was a small command of Moprgan’s rifle and a 2lber cannon. 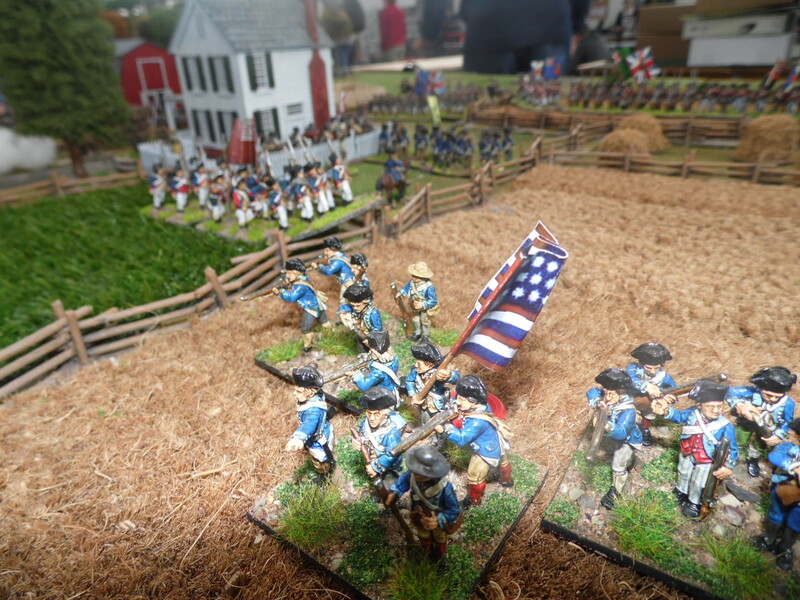 While this may not seem too much of a challenge, the marksmen’s ability and the range of the rifles made the Hessians too nervous and ended up targeting the rifles with cannon fire. 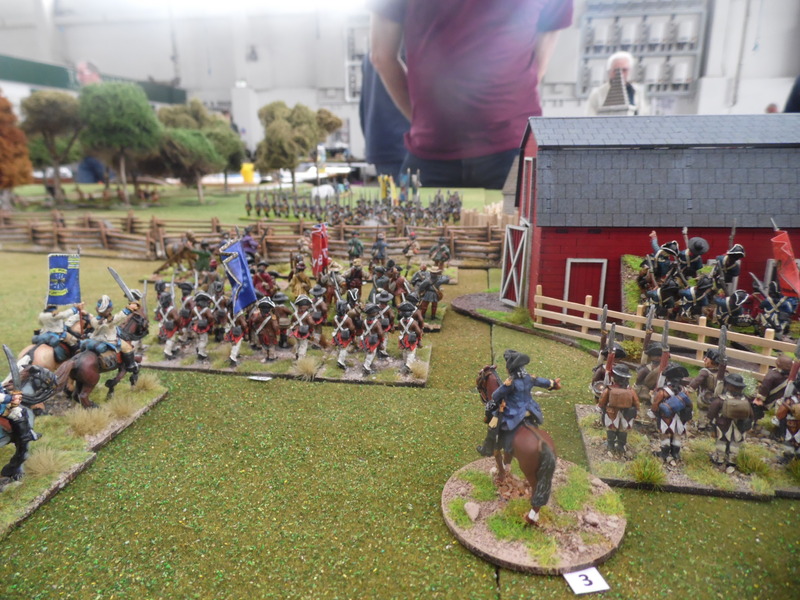 Bad dice rolls for the British trying to hit the skirmishers and brilliant saving rolls by Steve in particular for the Americans meant they hang around far too long than the British wanted. 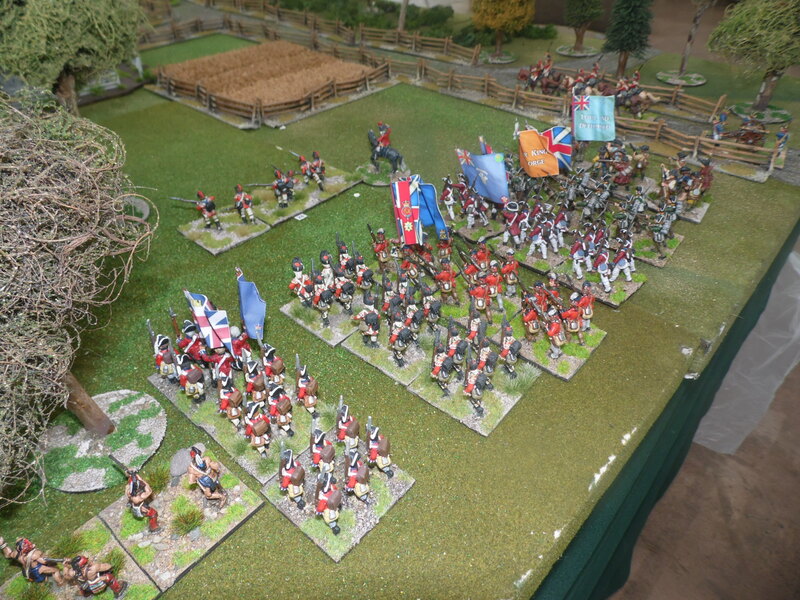 By the time the rifles had been cleared the American centre was full of support. 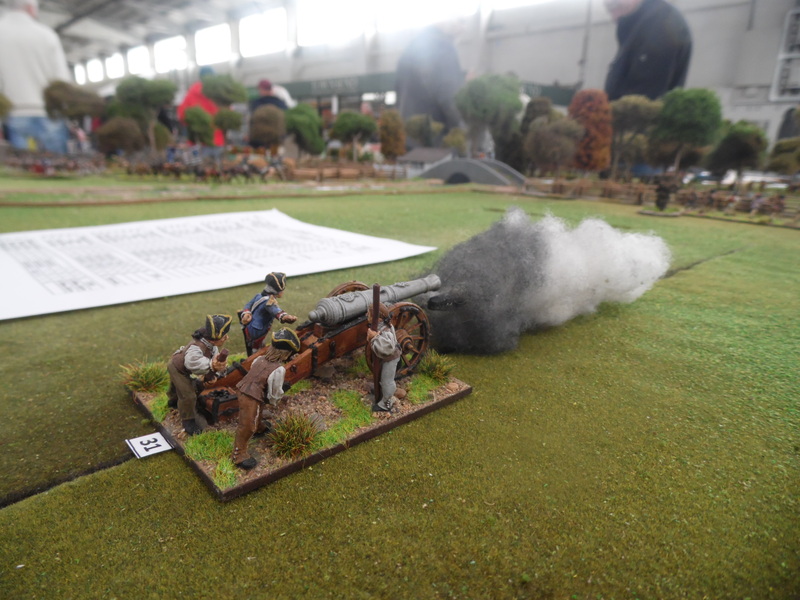 The British Cavalry had attempted to advance and capture the centre ground but accurate howitzer fire caused many of the British cavalry to break. First unit to be broken! A woman cleans the cabin hope the advancing British in the rear don’t burn it down. American heavy gun. This is a foundry model and comes with 6 figures but I only needed 4 as each figure represents the no. of damage dice is hits with. 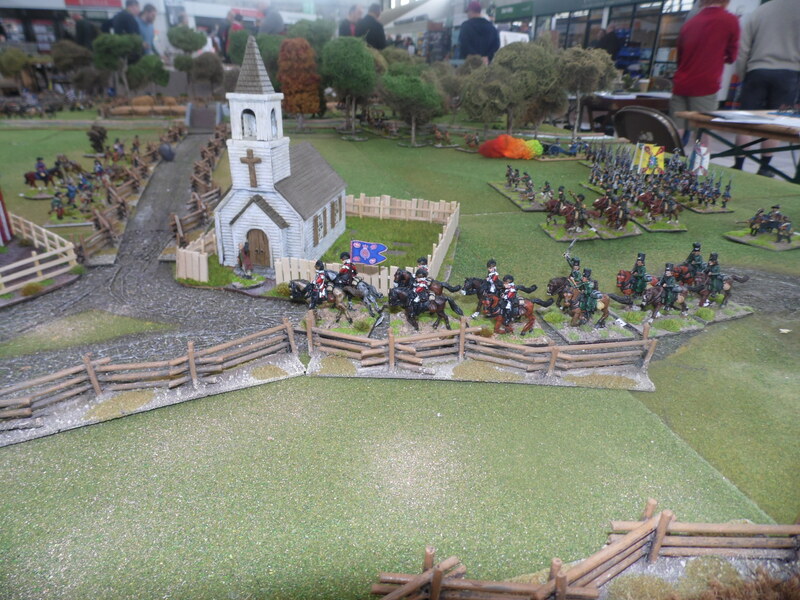 British Cavalry advance towards the town centre. Due to bad dice they were to stay there too long and become the target of the American Howitzer. British lights reach the plantation at the edge of the town. 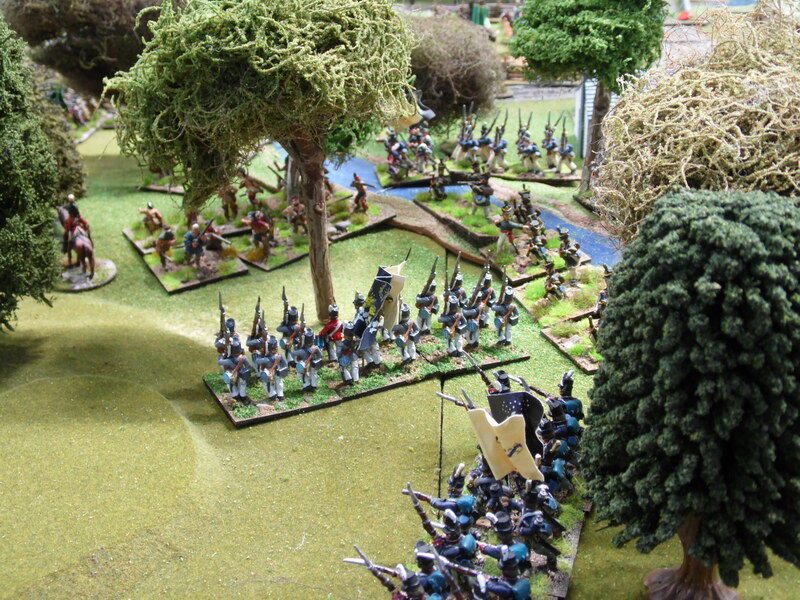 The British native units were making their war steadily through the woods next to the river. this eventually bought them out at the bridge. 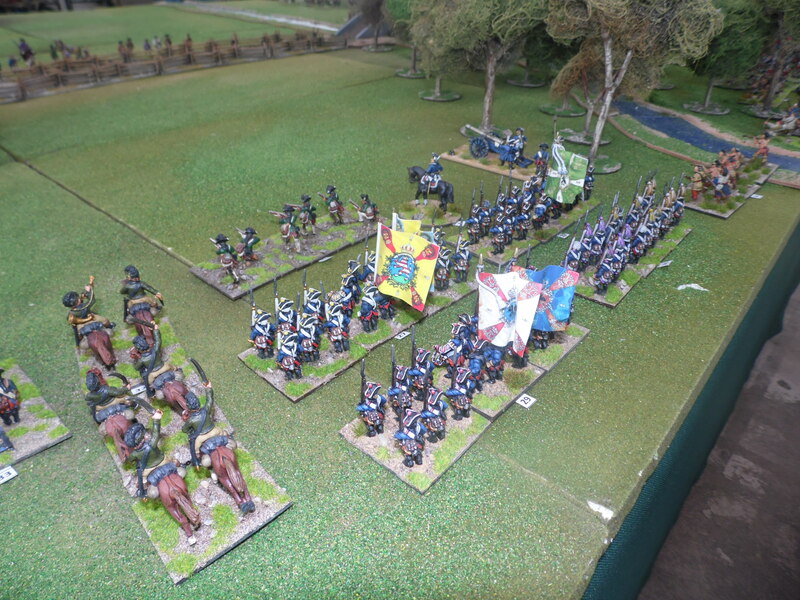 Not wishing to venture into the open to the poor morale when in the open they shot from the wood edge hitting the mounted militia. The British left was now trading shots with the American right which was advancing through the plantation and engaging the enemy, very well it must be said. 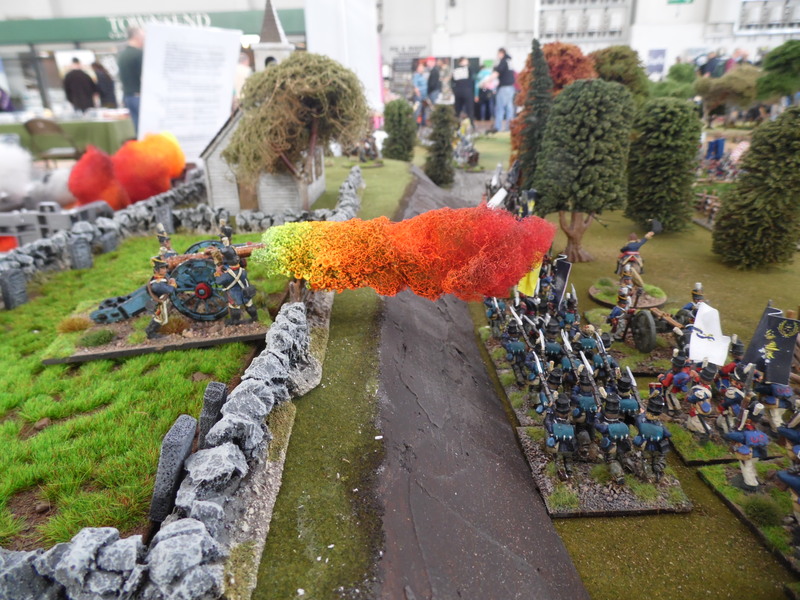 British right firing at the distant enemy. Maybe if they can capture the cabin the owner may provide refreshments or they could always burn it down! American left engage with British right in a fight for the cabin. 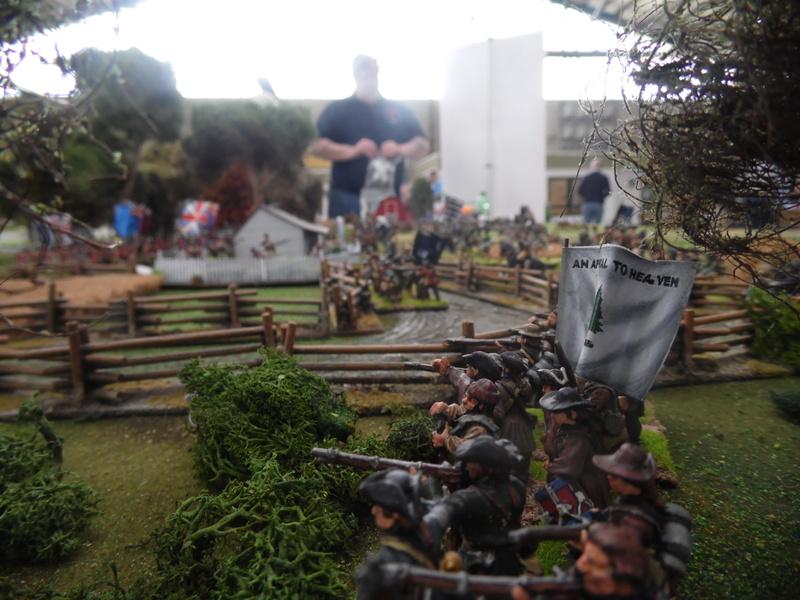 Morgan’s rifle get the reinforcements they hoped for. 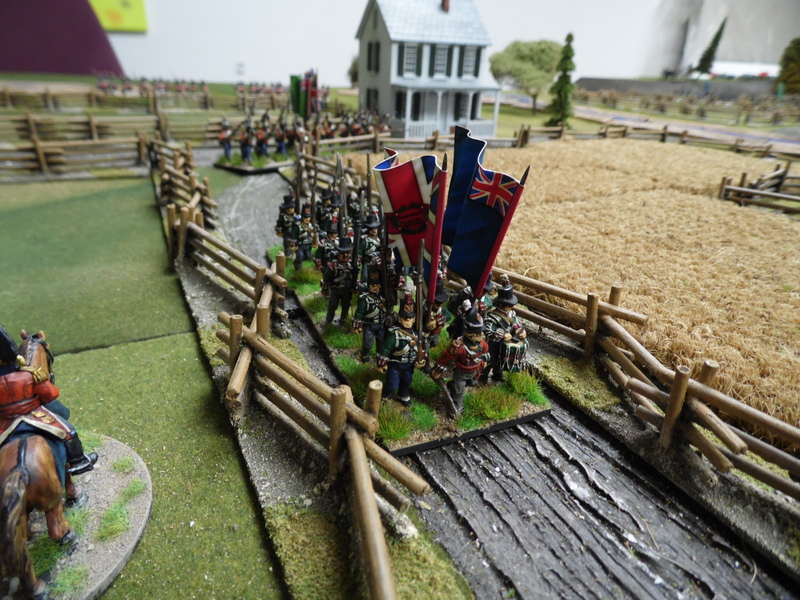 The Game ended and it was generally felt that while the British never secured the field, while the American’s were not in a great state to hold it. The American’s won though and so it was time to adjourn to the onsite cafe and have some Tea, I think the American may have even choked on it!! 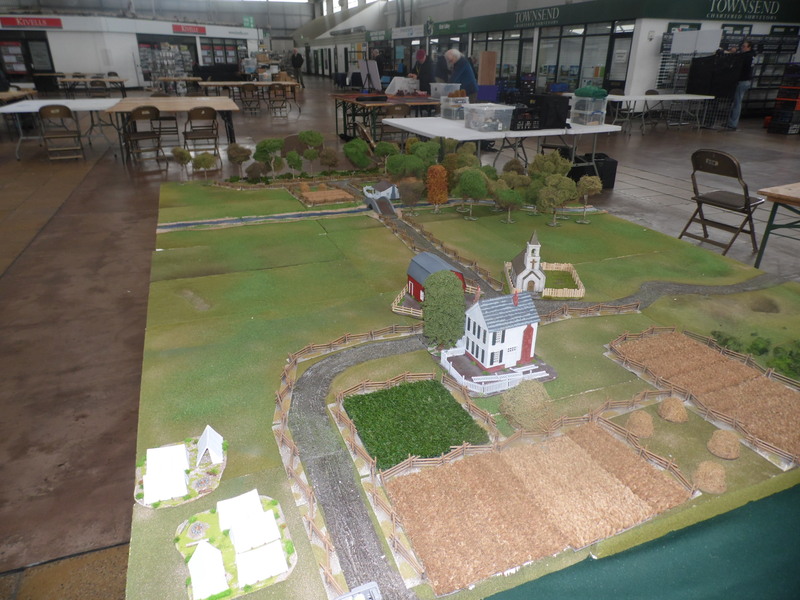 Thank to Combine Oppos Wargame Group of Brian (British), Steve (American), Laurie(American) and Nathan(British). I love the show with it being my local and as stated the venue is great, parking is free, loads of helper with trolleys if needed and best food ever. the only downside was the traders, many cancelled at the last moment and the ones that were there many sold the same items, great if you want Warlord items as you have the perfect bartering opportunity. What this can lead to is reduced sells and no returning next year. Everyone helped pack up and I was home in 10 minutes unpacking. See you all in a few weeks when we go to Weymouth for Fisticuffs which is at a new venue this year. Steve and Laurie have a secret game they are putting on so I cannot wait to see it. 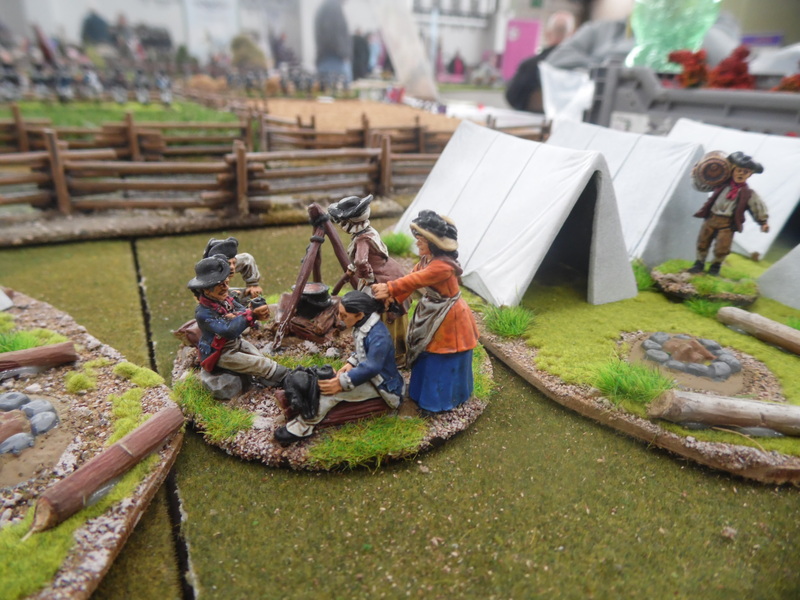 Another Loyalist unit to get on to the table is The Volunteers of Ireland. 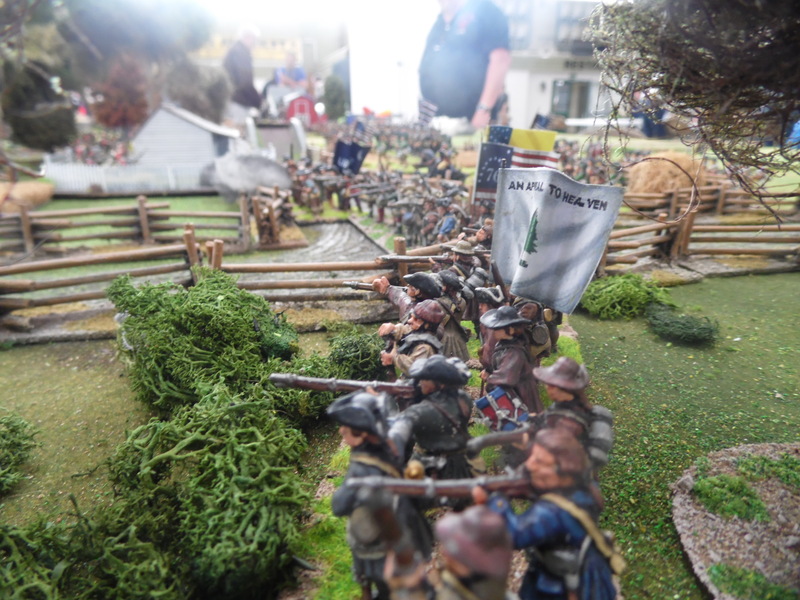 They were listed on the establishment as the 2nd American loyalist regiment and were involved in the Battle of Camden and a major player in the large skirmish action, the Battle of Hobkirk’s Hill. 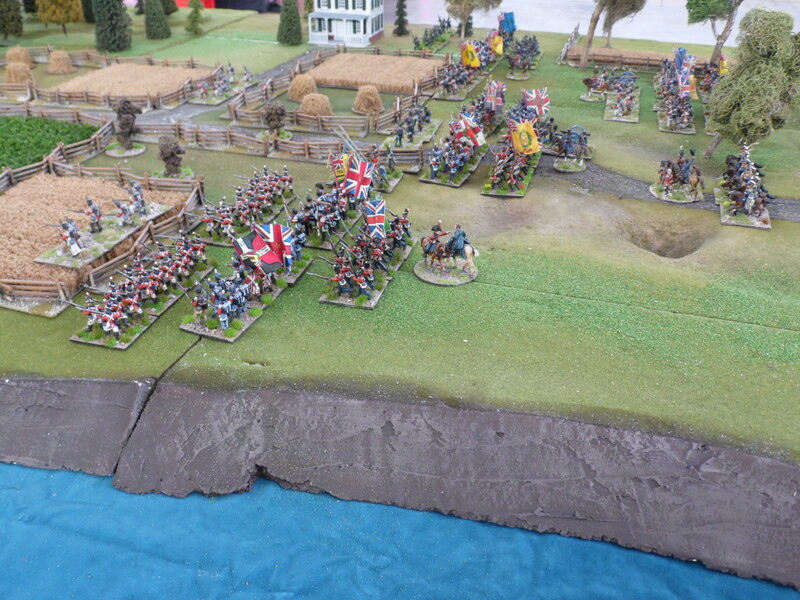 They remained in action until the surrender of General Lord Cornwallis. The regiment was moved by ship to New York, many of the men decided to move to Canada rather than return home. The figures are from Perry, made up from AW170 and 171. their flags are from GMB. The photos are not great so will try to get some better this weekend, with them in action. 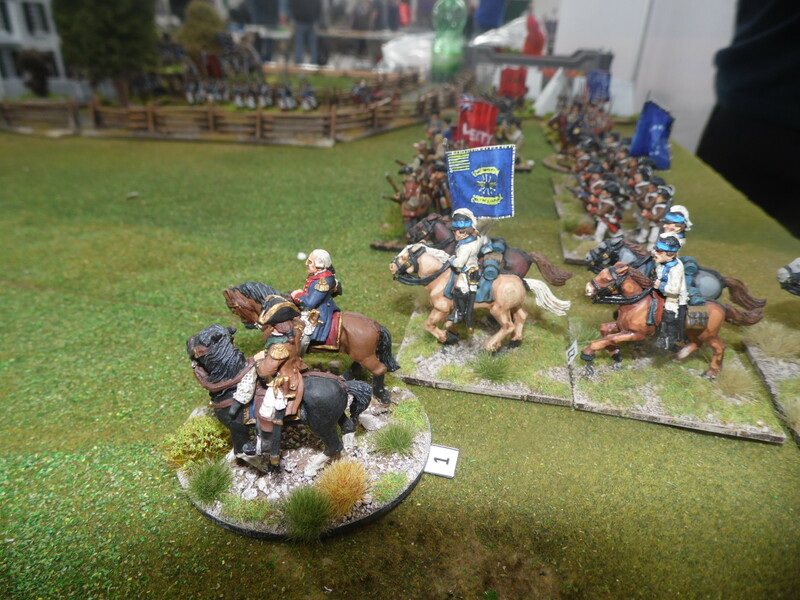 Legionary 2018 – The British are here. 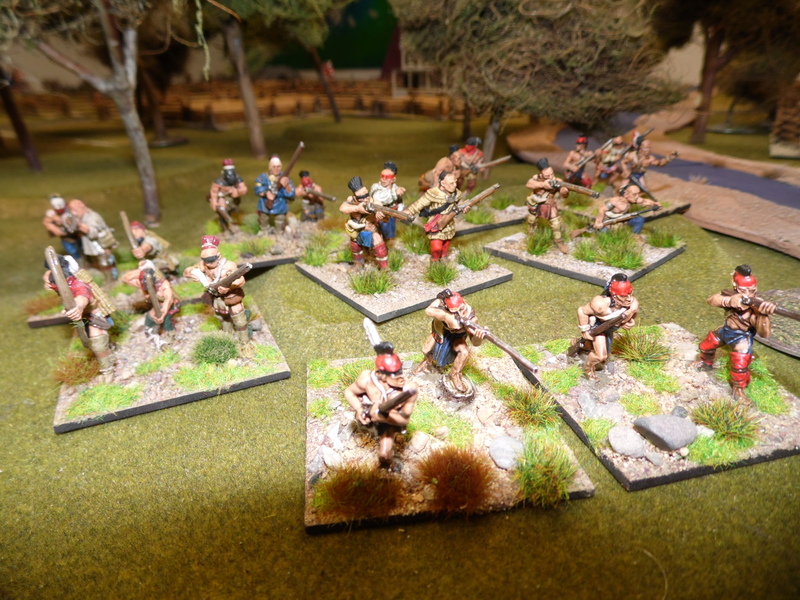 Part 2 – The King’s Orange Rangers. 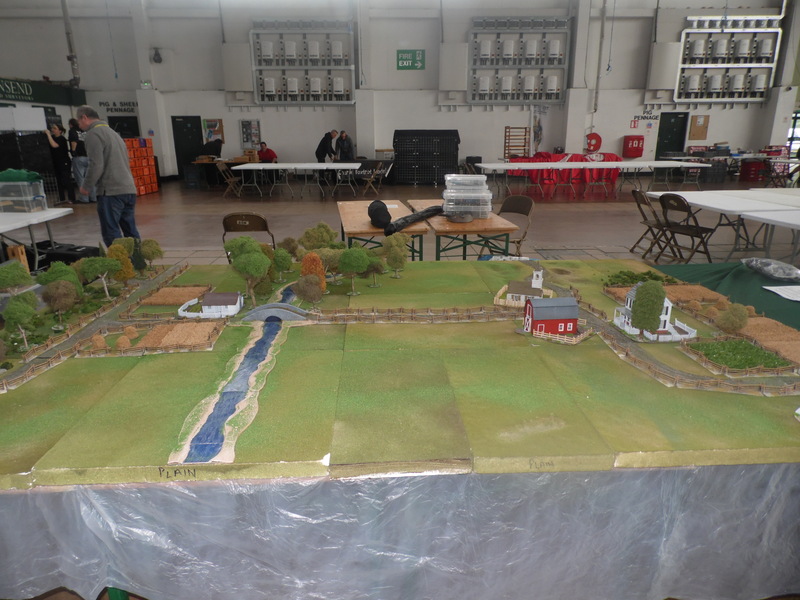 As mentioned in part 1 , this year’s demo game is about showing the diverse units available to use during the AWI. 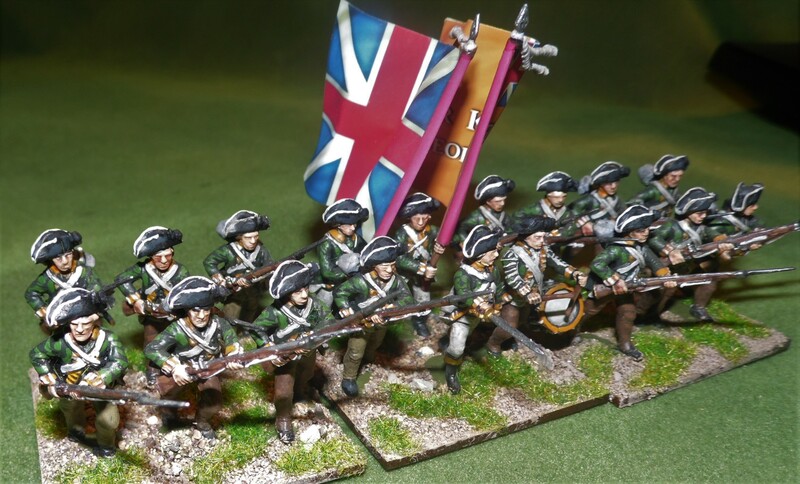 The first ” different” unit I will be putting on the table is the Kings Orange Rangers. They were raised in New York in 1776. Their uniform was green coats faced orange. Their facing are orange because of the county they were raised in. 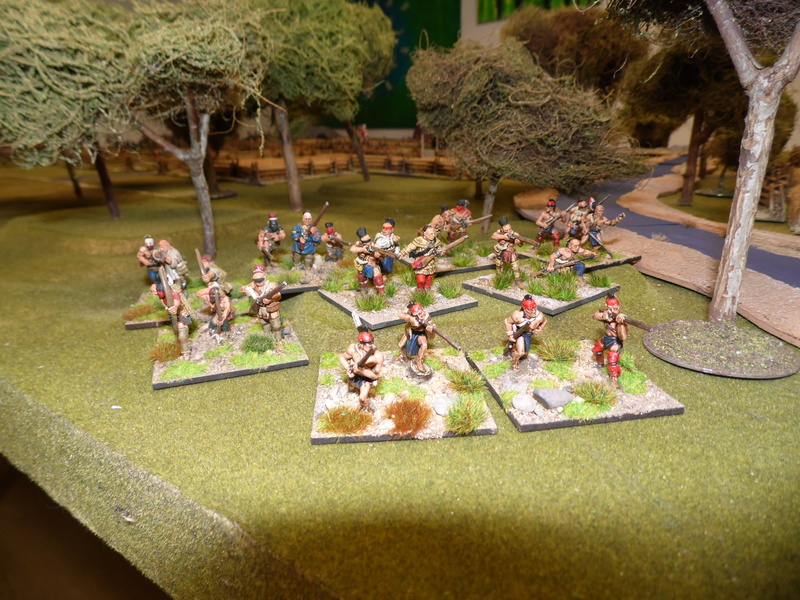 They will be fielded on the table as a Fire/Melee/Morale unit of C/D/C and because they only numbered about 200 men at their highest recorded strength they will have 2 SPs. These have been made using Perry British infantry as I could not identify anything special about them to suggest I could not use them. I was unable to find any references to a regimental flag so here they have a generic loyalist flag from the range by “Flags of War” which just had to be in Orange. 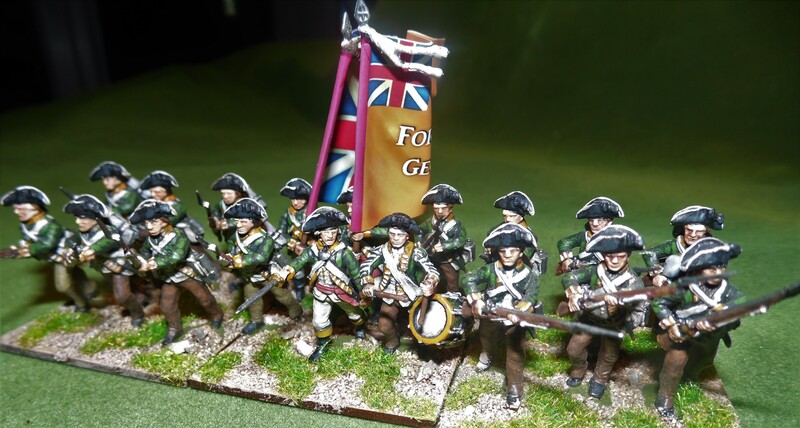 This unit was painted by Jono at “A Brush Too Far” painting service. 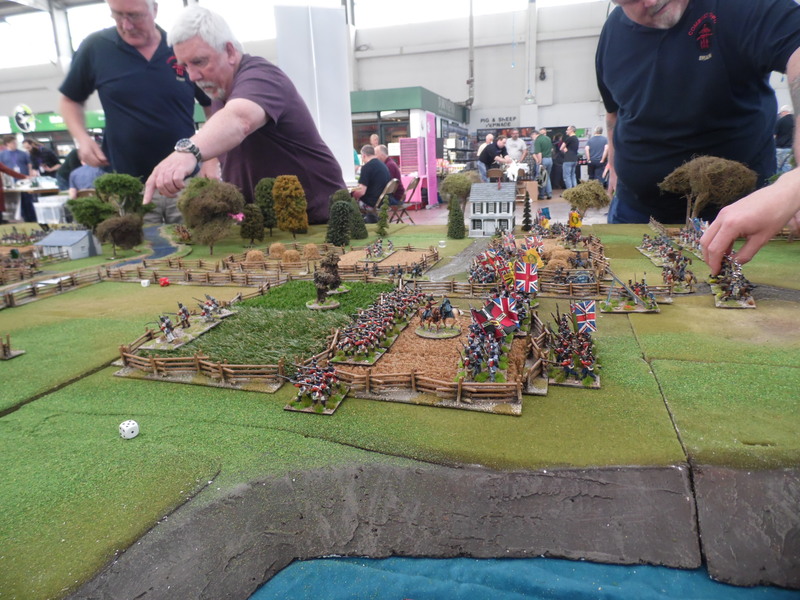 Legionary 2018 – The British are here. Part 1. I have to admit that the last year has been a nightmare. I now hope to be back regularly gaming and updating the blog. 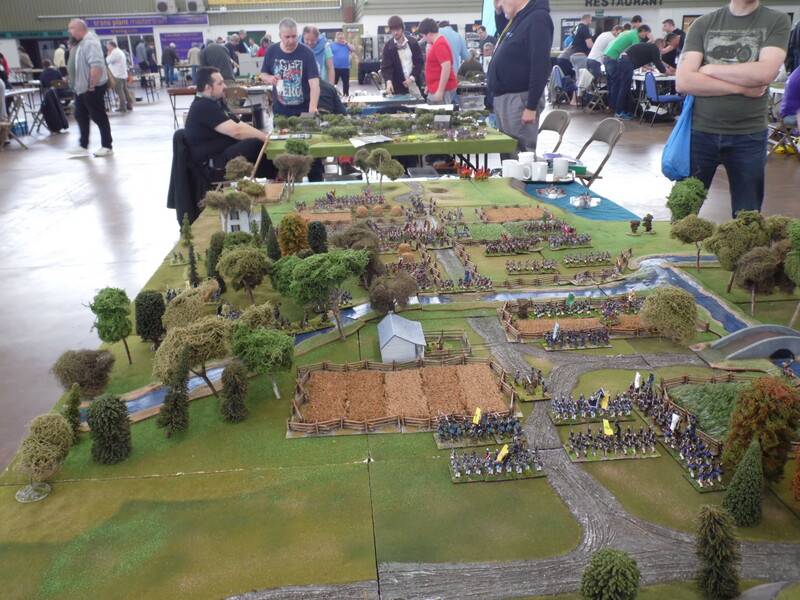 It is once again that time of year when I think about putting on a game at my local show Legionary http://legionaryshow.co.uk/ . Normally I do try to put on a era that is new every year. This keeps the game fresh for repeat visitors and normally gives me an opportunity to venture into and start collecting another new era. I see this as a challenge of sneaking all the new lead past the unsuspecting current Mrs C and convincing her when caught that I have always had them. 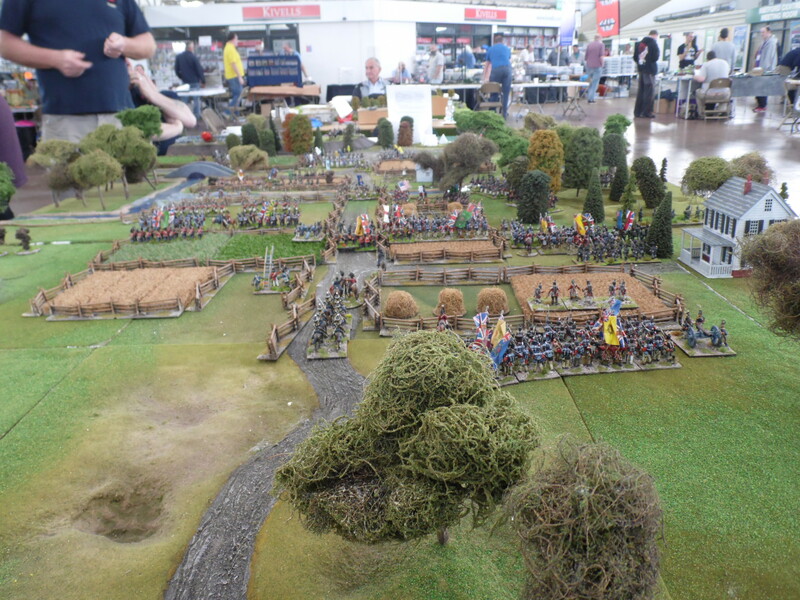 Due to issues I have not gone into a new era for this year’s game but it is an era I have not yet played at Legionary. 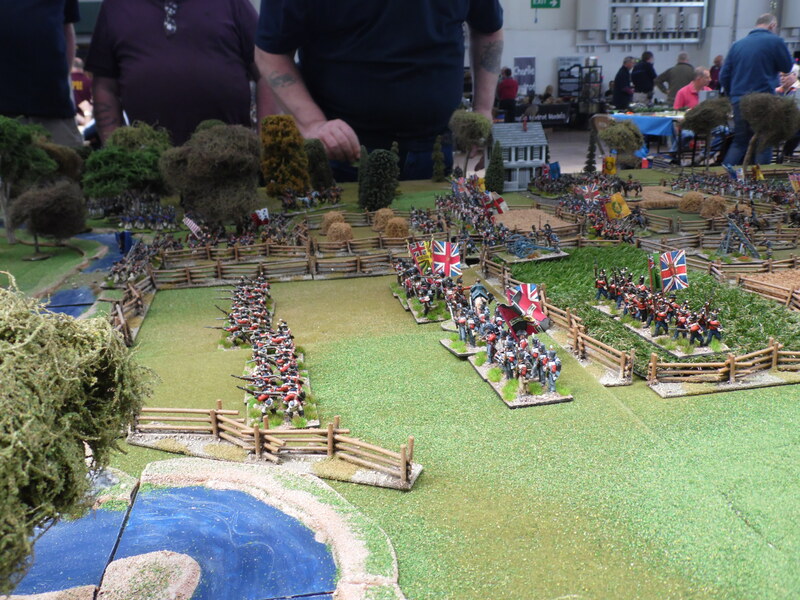 The American War of Independence – The British are here! 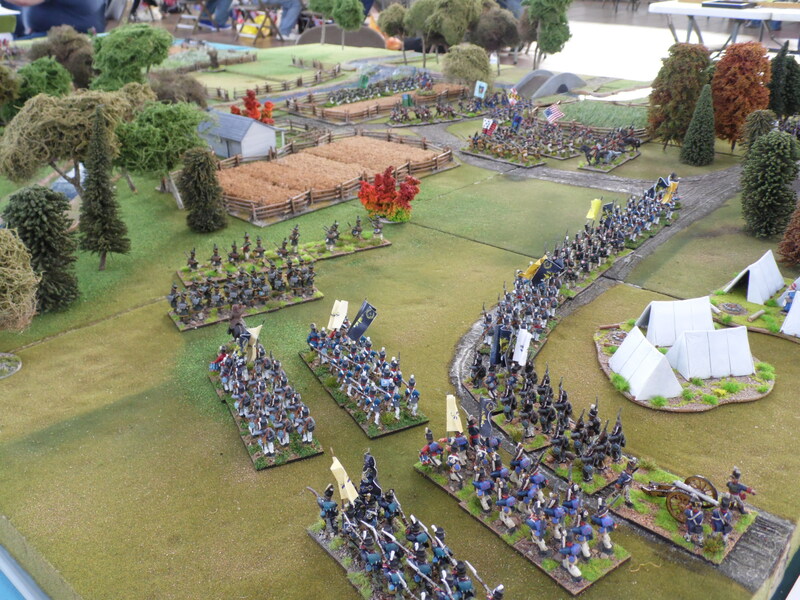 This will not be a demonstration of any particular battle but a demonstration of the figures, rules and various unit types that make this such an interesting period to game. 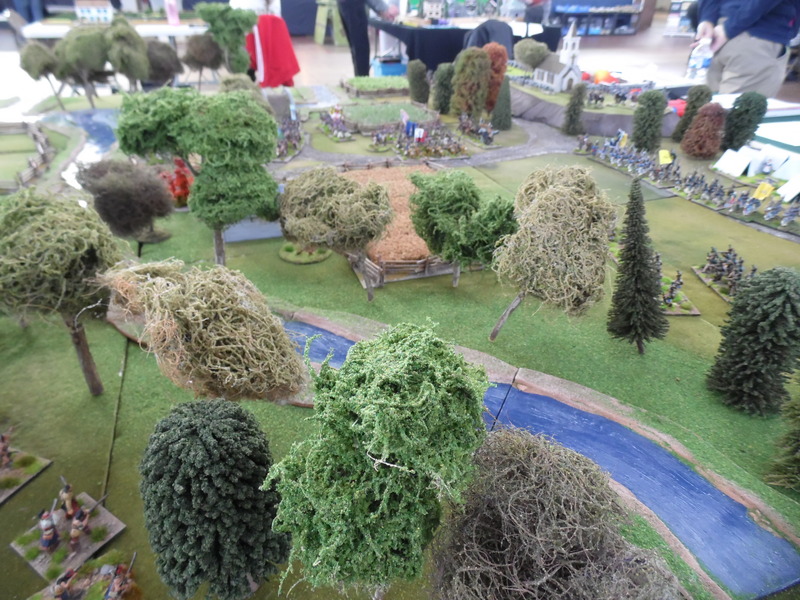 The scenario is around a few American militia units holding the advancing British at bay and hopefully help arriving before being overrun. 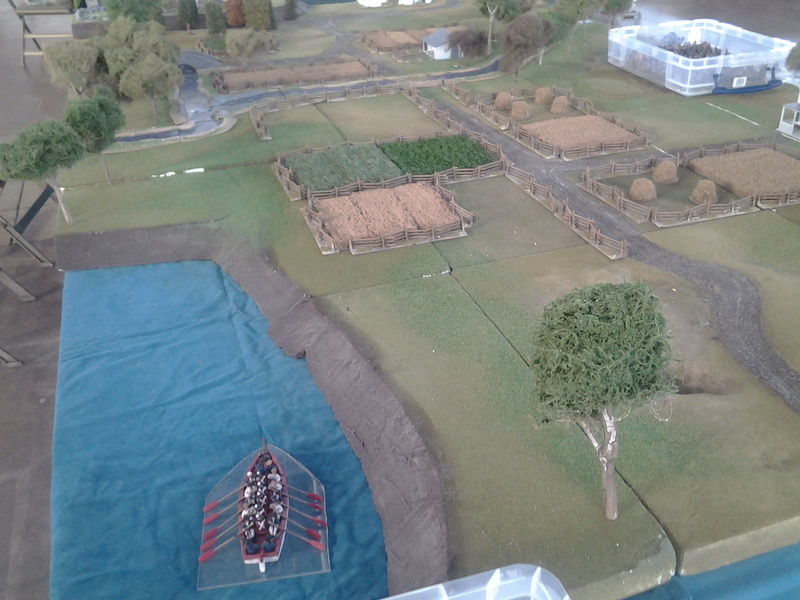 Meanwhile the British have advanced along both side of the river hoping to secure the main bridge and exits by the end of the day. 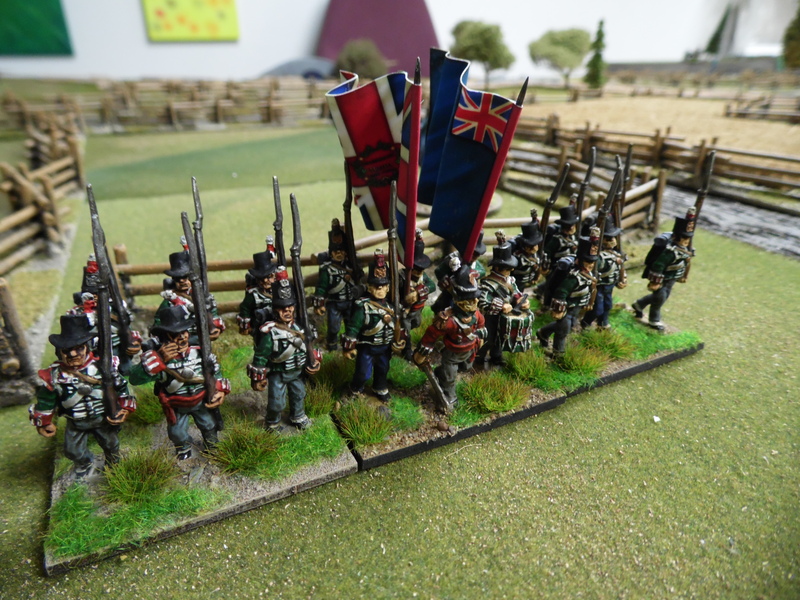 The Figures are all from my collection of Foundry, Perry, Old Glory, Redoubt and Wargame Factory. Over the next few weeks leading up to the show I will cover a few of the units hopefully appearing in the game. 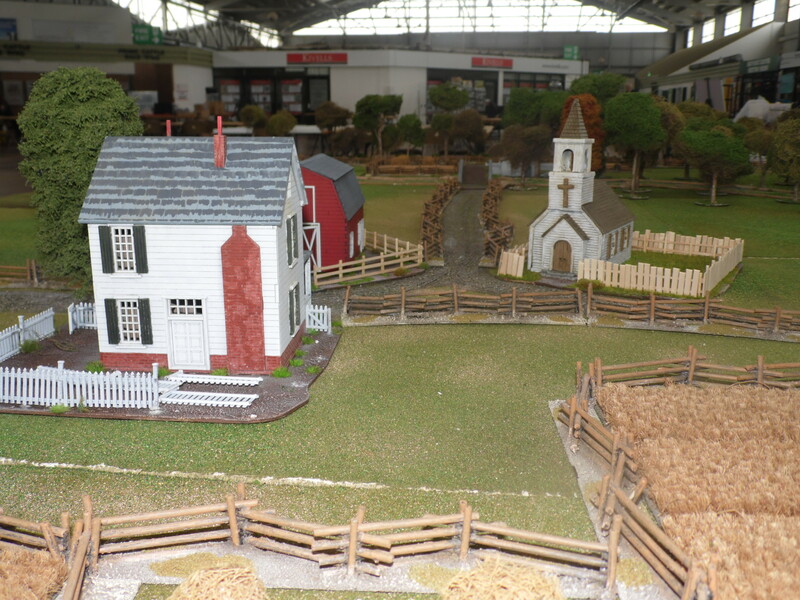 The Rules are our favourite Fields of Honor with home rules. Up nice and early having packed up the car the night before, I set off to Legionary 17. The roads were clear so it took me 6 minutes to get to the show. How lucky am I. In the past I have raved about how good the facilities are at the venue for gamers and traders, well this time I remembered to take a photo. How many shows can you unload next to your table? I had booked a 12 x 6 table. I started to lay out the terrain and place the figures. The game was to be set around August 1814 when both sides were sitting around a table in Ghent brokering a peace deal. The Americans not wishing to have to give up any of their country following a reversal of fortune and the British trying to reinforce their position. To give them a better bargaining chip a force has been dispatched to seize the Washington DC. The scouts tell them the road is open apart from a few militia. The British ever confident set off. 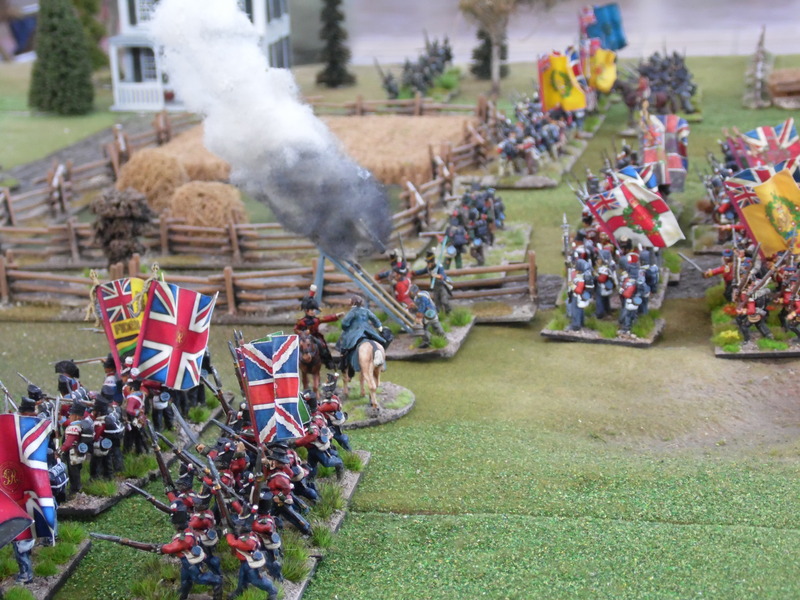 The Americans have been tracking this force and have guessed what the British are up to. So to stop them they rush all available troops to the area. This means that to initially stop the British there are some militia infantry, Cavalry and a gun. 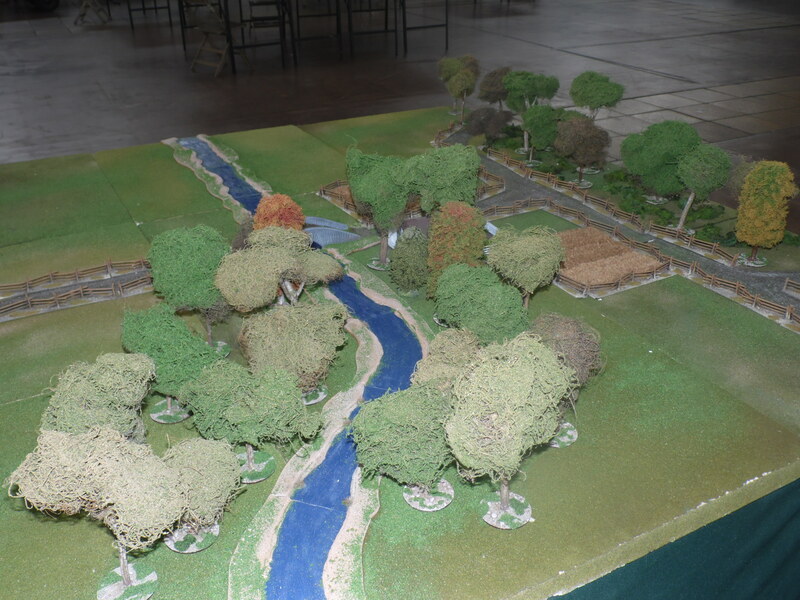 Here you can see the Amera Plastics river. Across the British Lines. In the distance you may just spot some supporting gunboats. These were classed as heavy artillery but took a turn to reload. They could also not move as they were at anchor due to the current. 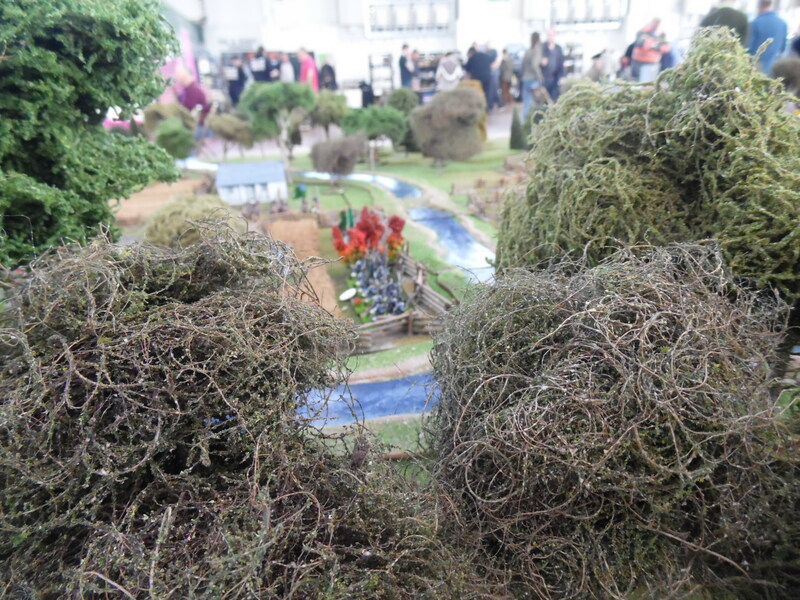 In the centre you may be able to spot the royal marine rocket team. These were the stars of the game and anybody who was watching when they fired, all commented on the process we use to see where they land!!!! 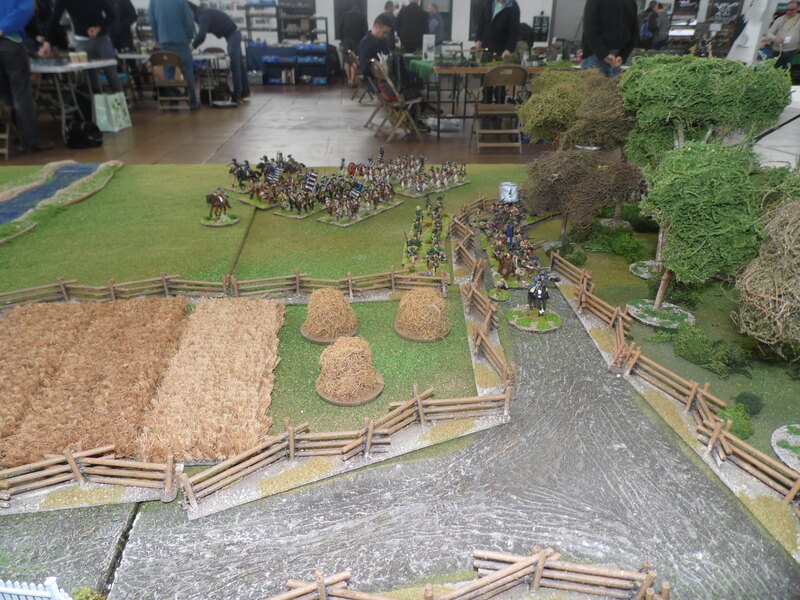 The game started with the militia units having taken up position behind the fences, just shy of the river. Just on the British side of the river waiting in the woods were 3 units of Indians. 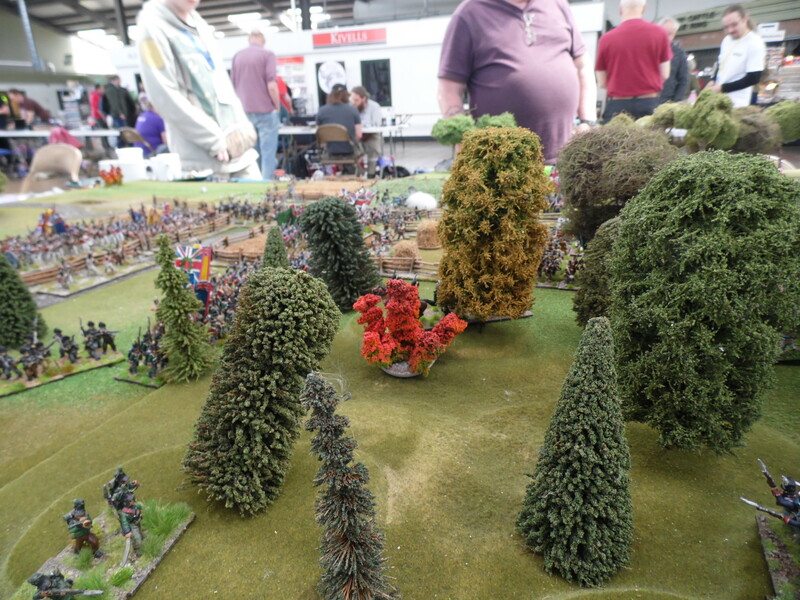 In our games Indians can deploy up to halfway across the table if in a tree line otherwise normal deployment rules apply. 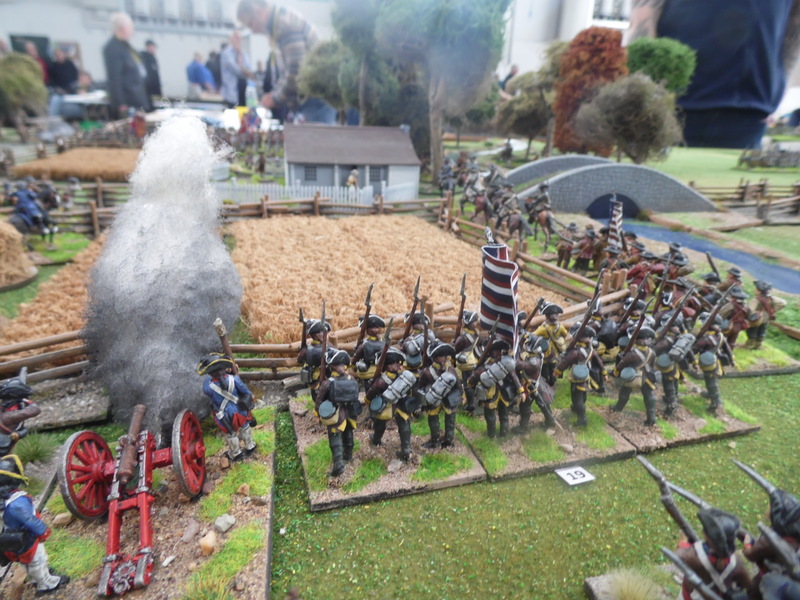 The British fired their rocket – they decided to roll 7 sets of dice. A D6 for direction and a D10 for distance. The first two dice rolls looked good then a few wild rolls saw the rocket head towards the British units on the right flank. The final three dice rolls somehow correct the direction and landed the rocket within an inch of the original target. Must get Nathan to pick next week’s lottery ticket. The Freed Color units did not like this with one becoming shaken. Not a great photo but you may just spot the Freed Color militia , the shaken unit has a white counter. Rocket crew fire again. this time nearly taking out one of their own gunboats! 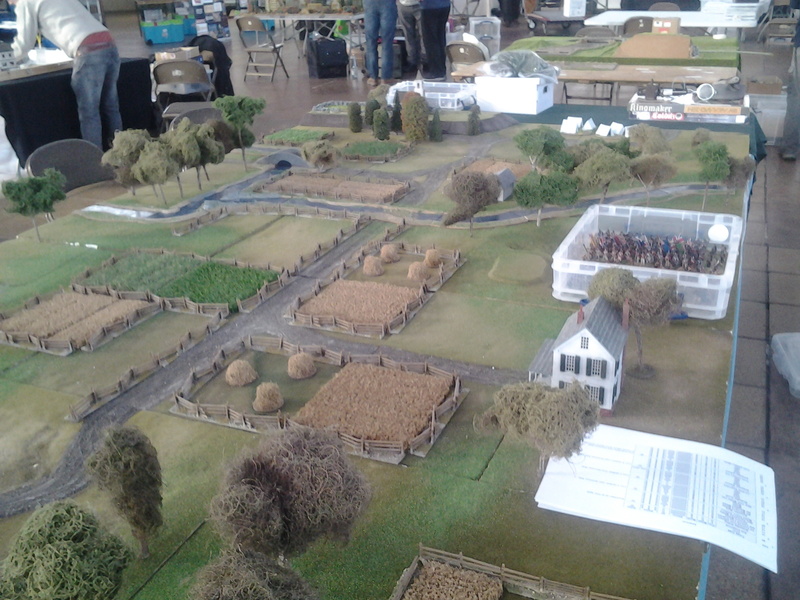 British are in the fields! 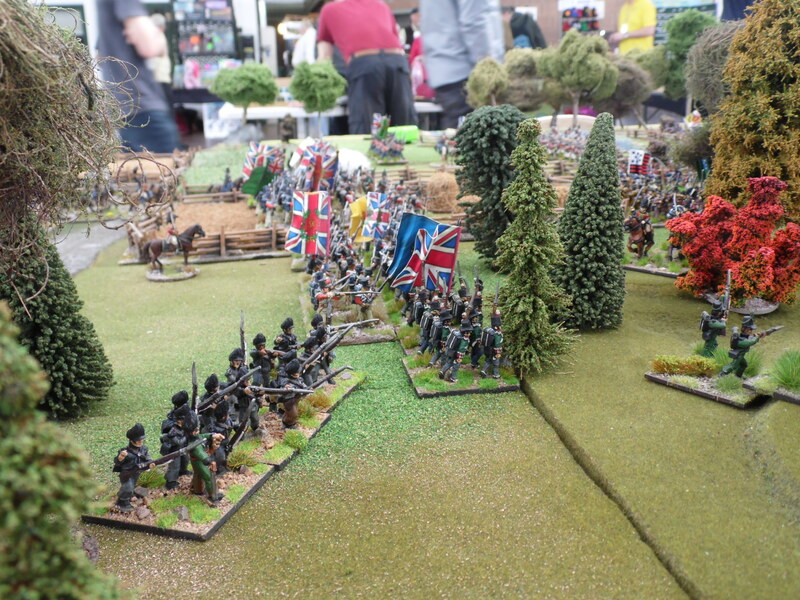 The British advance continued and American reinforcements start to arrive. 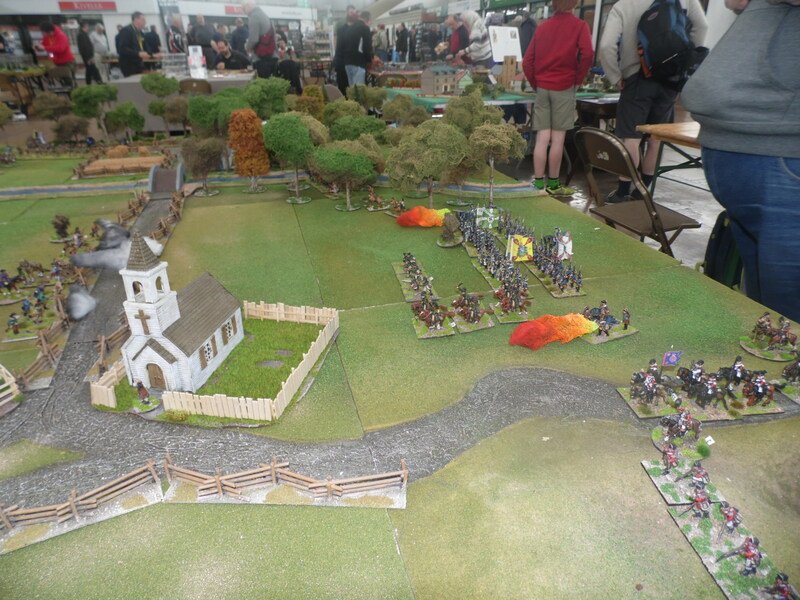 The American militia had a heavy cannon mounted on the hill by the church and so they started to fire. The first shot hit the advancing 1st Royal Marines. Both sides traded shots and the militia taking the worst of it started to fall back. 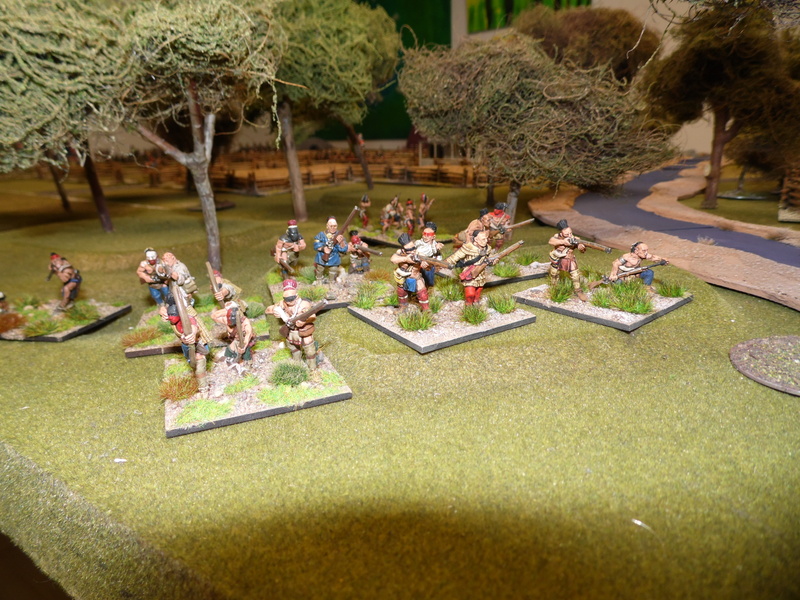 American regulars advancing up the left flank enter the woods to chase out the Indians. It takes 4 line and a unit of rifles to finally clear them out. 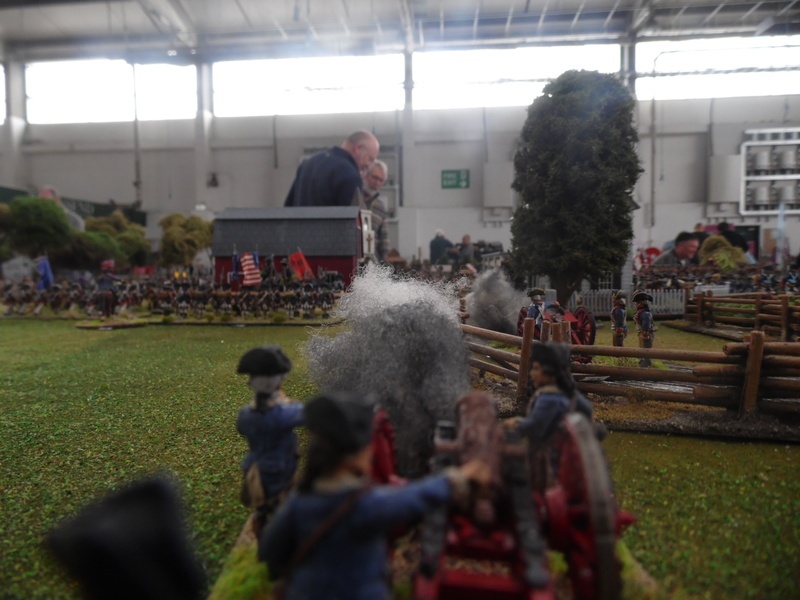 The remaining militia attempt to hold the ford! 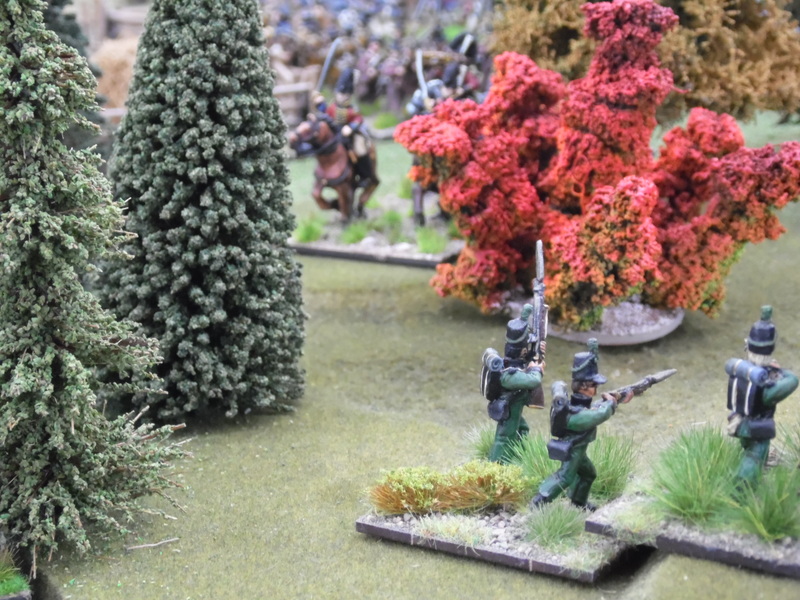 American regulars advance into the woods! 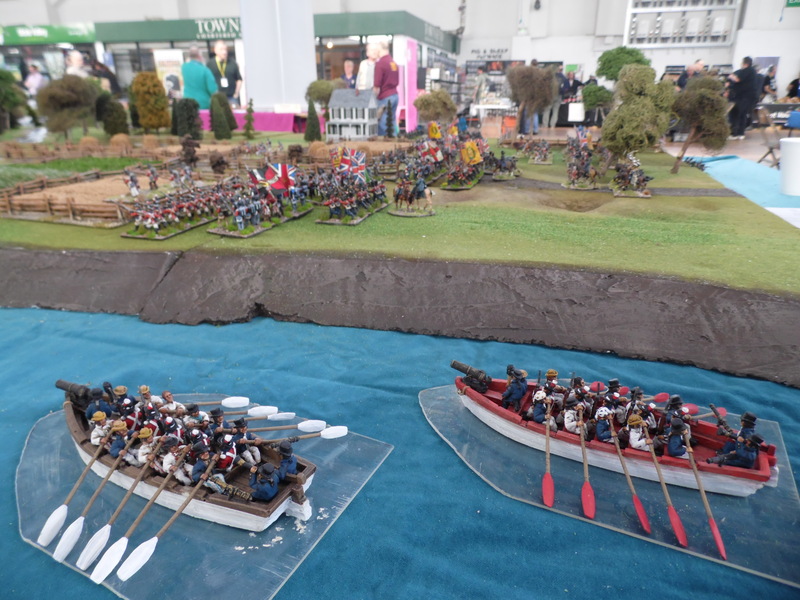 Royal Marines advancing on the river, in the rear ranks are the 5th west indies regiment with the two Swiss Regiments Du Meuron and De Watteville in the middle (great flags). 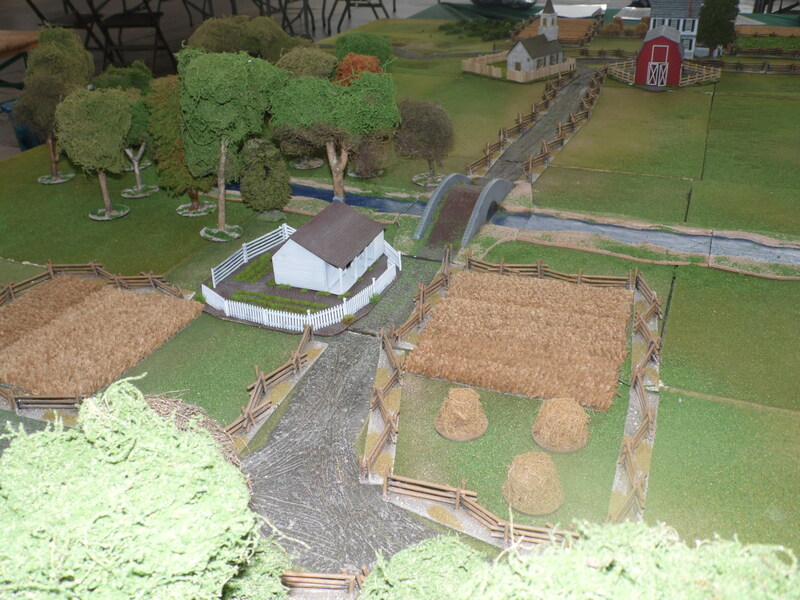 The American advance down the left flank was not to continue as they were faced with the Canadian brigade and a rocket aiming at the American Right flank landed in the woods and 4 units had to test morale (Enemy units under flight path of a rocket have to test). 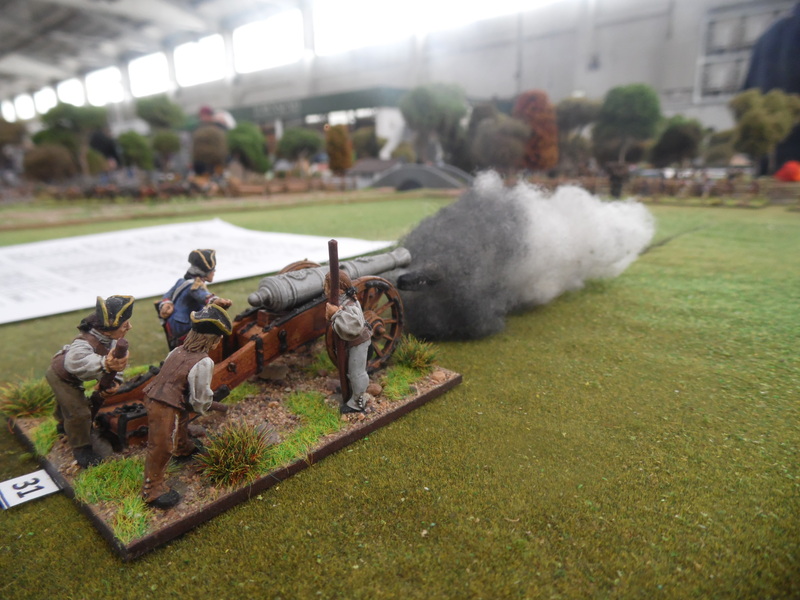 Another rocket just misses the advancing British! 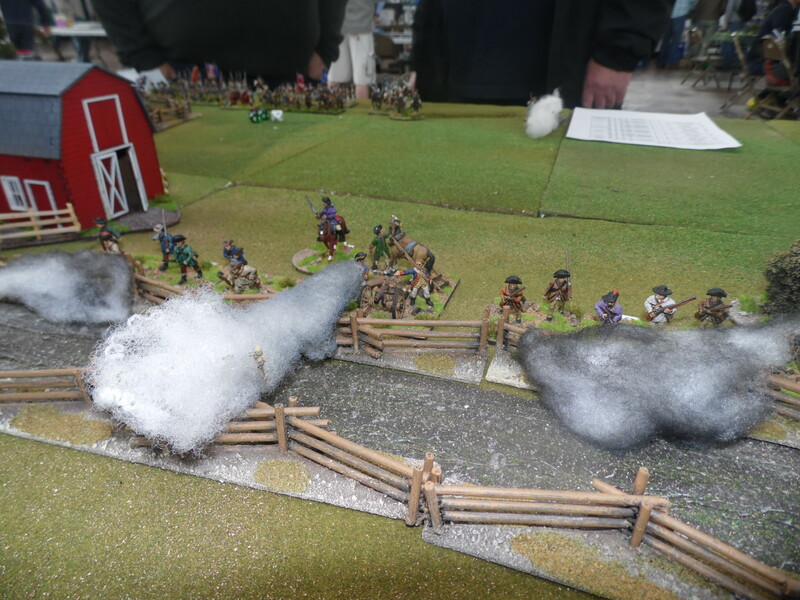 7th New York Militia and the Glengarry Lights trading shots when another rockets lands and frightens the horses making them shaken and a sound volley from the Glengarry finish them off. 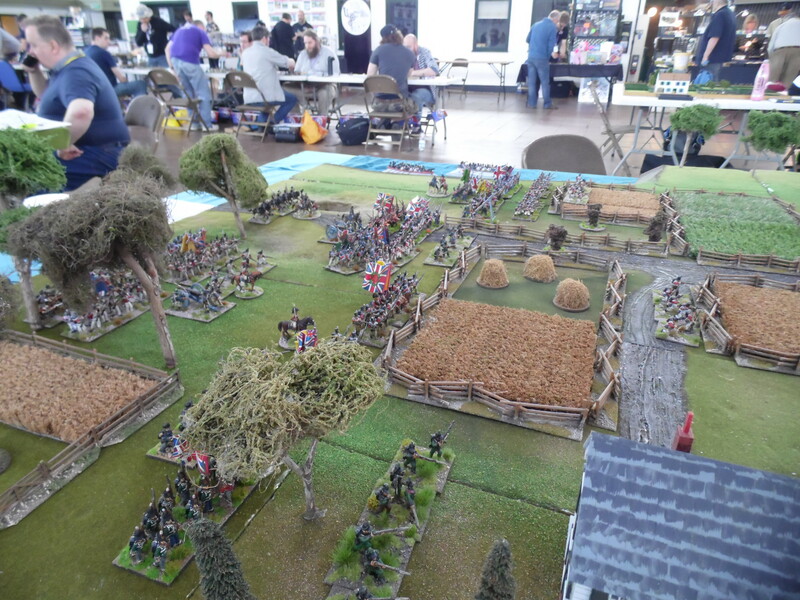 The British push back the American Left and take the river but the lead units have taken a little too many casualties to pursue the retiring, not retreating Americans. A great game was had by all. 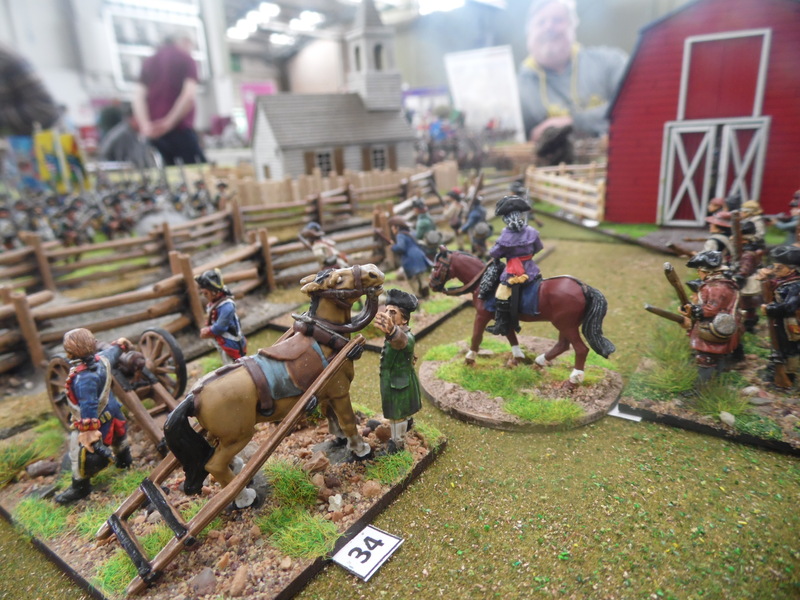 It was especially great to get such positive feedback from the visitors and especially some new gamers asking about the figures, rules and terrain. 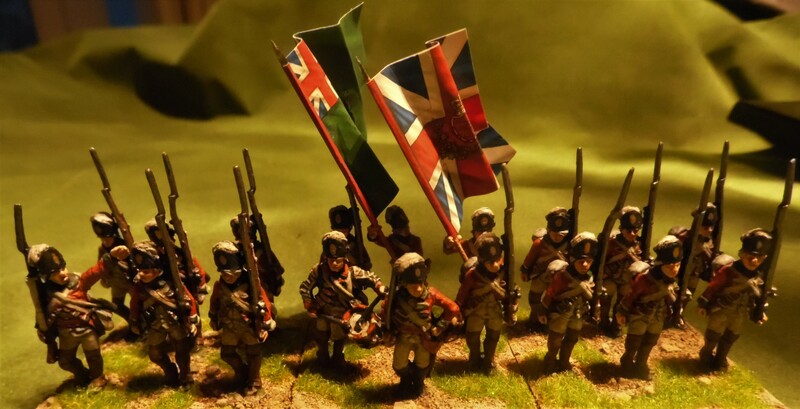 Figures- Old Glory, Knuckleduster,Foundry,Victrix, Elite, Britannia and Perry. Trees – Mostly hand made(please see blog) and K&M. 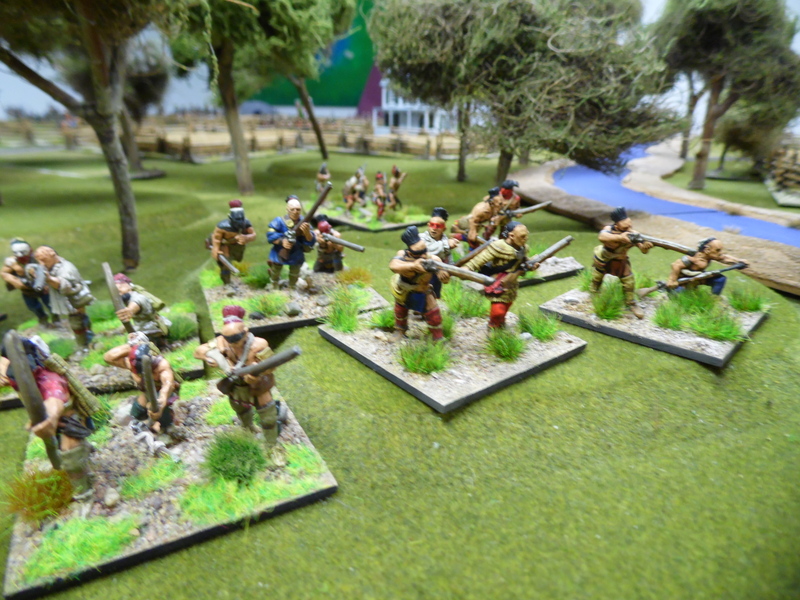 Hopefully you will get to see some better pictures as the photographer from Wargames Illustrated was on hand to take a few which I hope will be in the magazine soon. 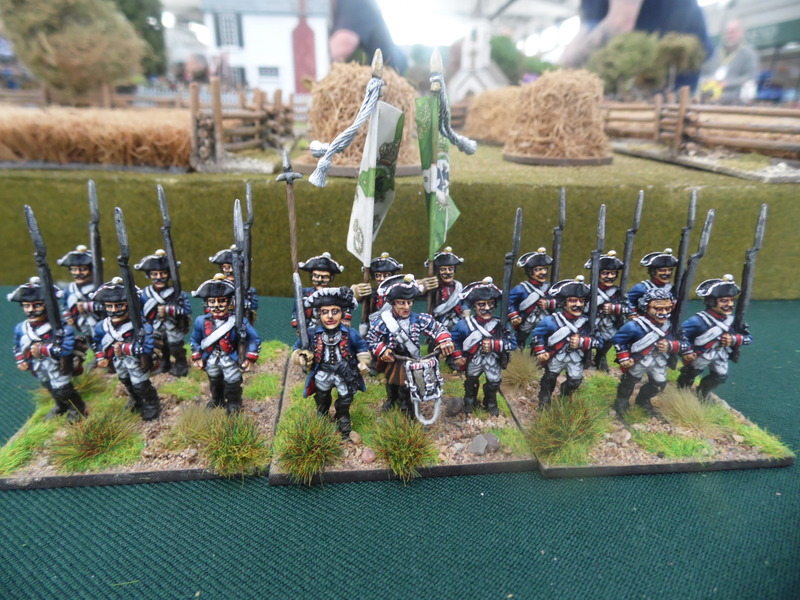 A big thank you to “A Brush Too Far” painting service who helped me out with a number of units towards the end. Thank you Jono and Mary. 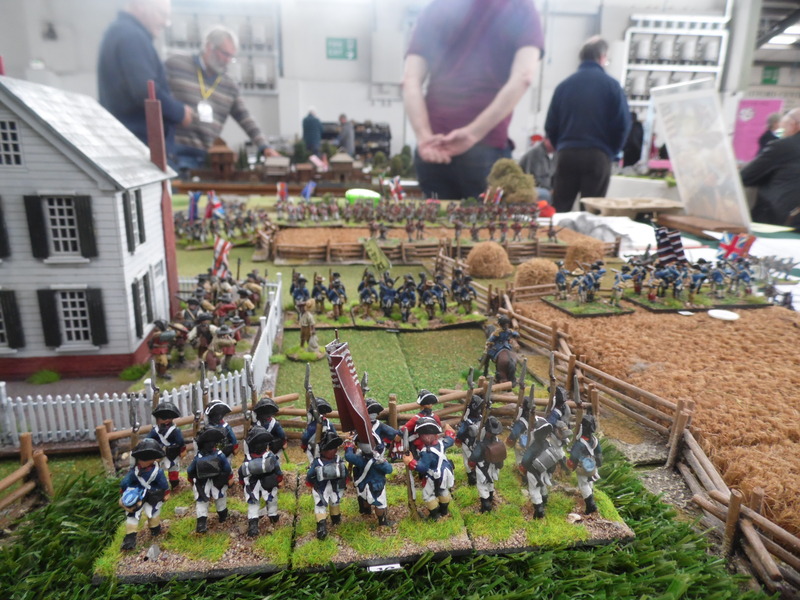 RULES – King George Commands and We Obey – see blog. 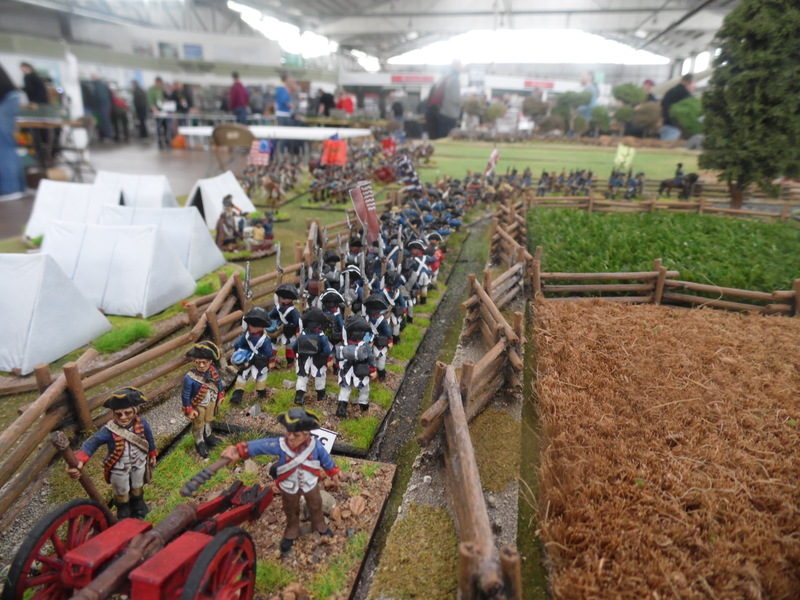 My demo at the Legionary show is based on the American War of 1812. Last night I finished another unit for the table. Here they are mixed in with a few units I already had. A few days rest now although I may attempt to make a few trees over the weekend. 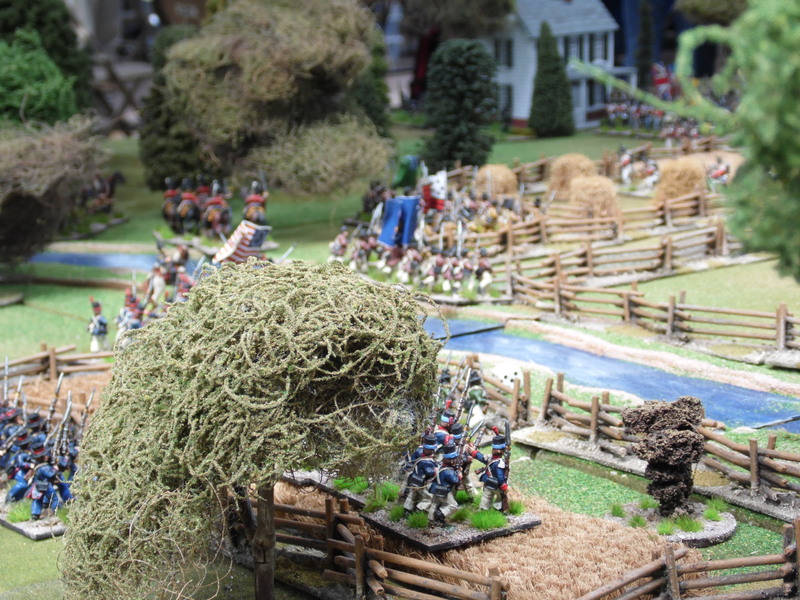 The Incorporated Militia of Upper Canada. This unit were always going to be in any army as I was just attracted by the uniform. 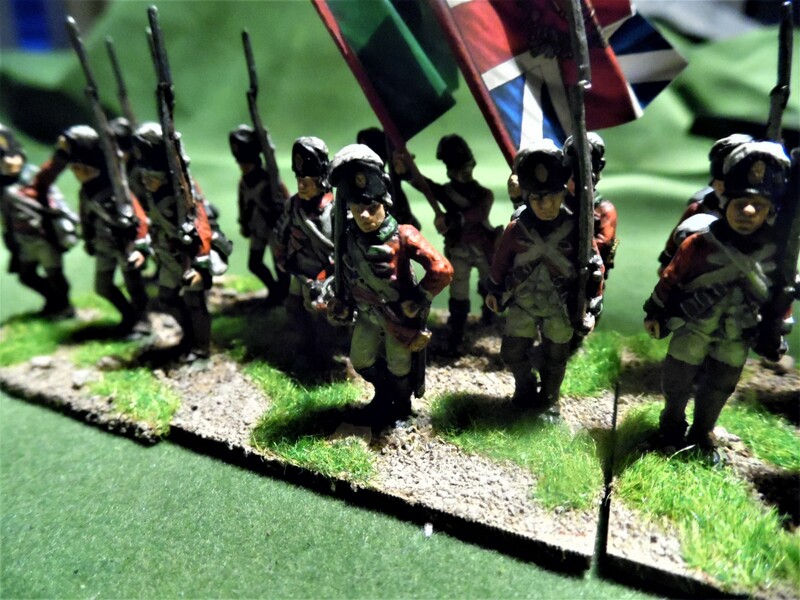 I have decided to paint them in their early uniform which they apparently changed some time in 1814 to a more traditional Red face Blue. The earlier uniform was Green faced Red and trousers in a variety of colours from Grey to Oxford blue. 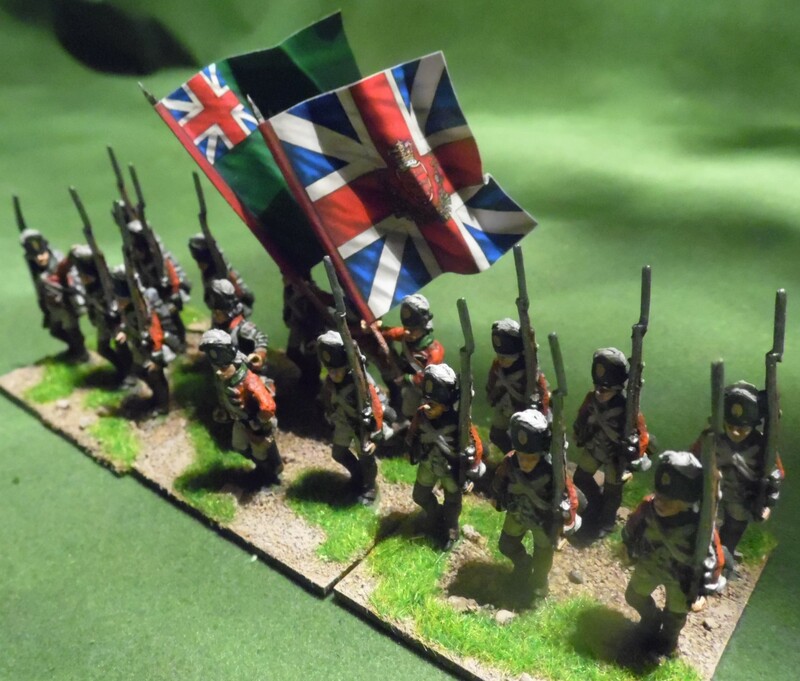 The only issue I have is that the only flags I could find seem to represent the later uniform, as the regiment colour is blue and not green. That said I cannot find any evidence of a green regimental flag, I just assumed it would or should be. The figures are Knuckleduster with a few Old Glory and the flags are from Flags of War. Tonight I hope to finish a few Indians!